Friday’s are generally good in most respects. Last day of the work week, excitement builds towards a full day of potential sleeping in and doing fun things at home. Kids get to do show-n-tell at school today. Nora will be displaying her “Doc McStuffins” doctor bag (show on Disney Jr) and Oliver is taking a tool box full of Legos again for the third straight week. They look forward to Friday all week for this. I guess they must be allowed to play with the toys some too. 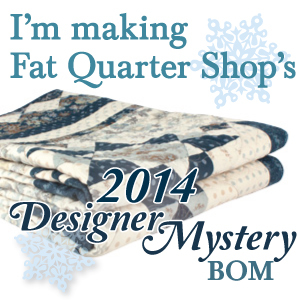 After I listed my Fall projects yesterday, I had forgotten about a new quilt I have planned for my MIL. I have always wanted to make her a patriotic type quilt, but I had not found the right pattern. Until the new Fons & Porter magazine came out and it features a pattern by Mark Lipinski (see bottom left hand corner of cover). I really like it and the fabric that he used. However, the article didn’t say what the fabric collection was – but I happened to remember seeing one of them in a show that I had recorded and still on my DVR. The show was an episode of Love of Quilting on PBS, and guest starred Jo Morton doing a bunch of triangles. So … I rewatched the episode and learned it was from her Hurrah fabric line. 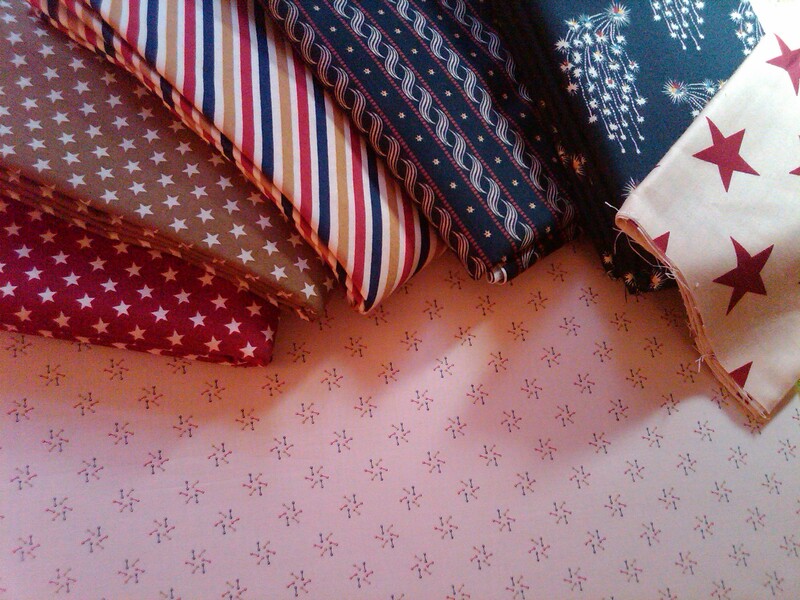 Online web search ensued and I found the fabrics I needed for the quilt. They arrived yesterday! So, no need to let it sit – let’s start cutting! I was able to get all of the background squares cut for the red stripe portion. Then I had to make templates for the pie/crust shapes. I wanted to test out one block at least to see how my ability to machine piece a curved seam would go. I think it turned out well. 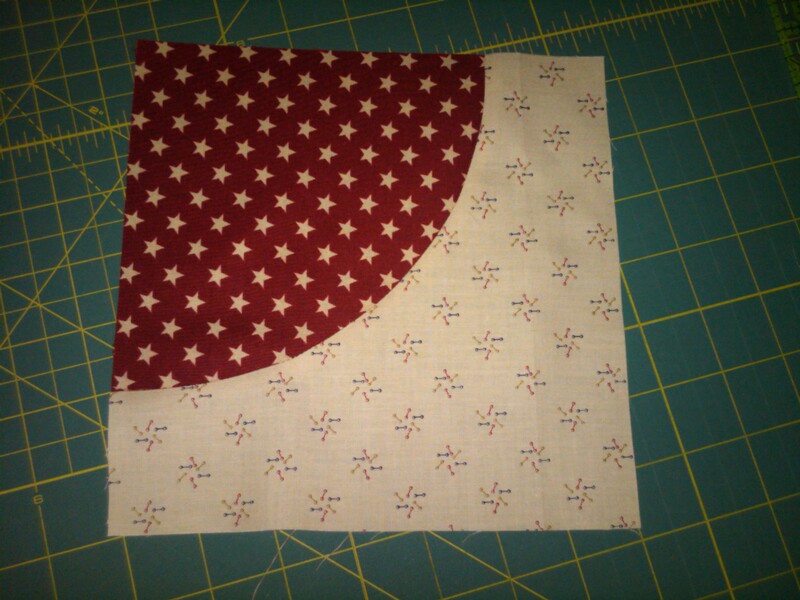 I may make my future blocks a little more scant on the 1/4″ seam allowance and they should be perfect. This will be a kind of ‘drunkards path’ pattern, which I have never made. The magazine labeled this pattern as “Challenging”. I take that as a challenge I guess! Wish me luck! The Monday part of today was that Stewart got new tires yesterday afternoon on his car, but this morning one of them was completely flat. We start off our mornings here around 85 degrees and what feels like at least 70% humidity. 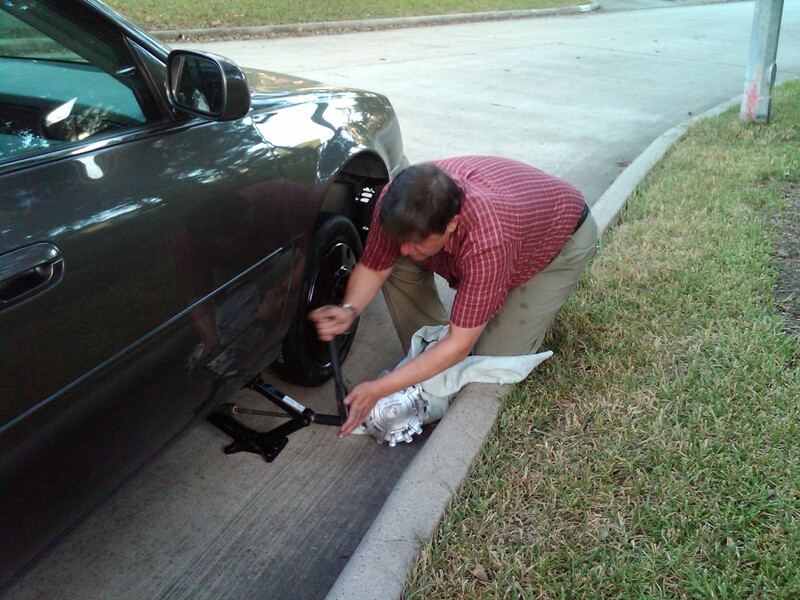 But he changed out his tire with the spare … and guess what? The spare was flat too! “What the !@#$@#!%! !” (his words, not mine). He had a presentation to get to early this morning, so he took my car and I dealt with the flats. Called up the tire center and they dispatched someone out to repair and load on the new tire again. And he aired back up the spare as well. He said the tire just had a small leak at the stem valve. Whatever. It was suppose to be new, but I guess it can happen. Anyway – I wasn’t that much later to work than normal, so no big deal. Hope all of you have a great Friday and relaxing weekend!